Centre County PAWS Director of Operations Lisa Bahr holds Simon in the cat room. Soon the shelter will be adding an addition to the cat area so it can help more cats like Simon in the future. STATE COLLEGE — For some time, the folks over at Centre County PAWs have dreamed of having more space to for their large number of recue cats. After all, said director of operation Lisa Bahr, they receive many calls every day from people who have cats that need rescued. Holland wanted to make a donation in order to have something named to honor his sister, Cherene Holland, and her love of animals. Cherene had adopted a cat from PAWS and he felt it would be a good fit for the honor. The problem was that all of the rooms in the facility had already been named after donors. This presented PAWS with an opportunity to get the extra space they had been hoping for, and with his donation, the group was halfway to the goal. Now, after receiving another large donation from an anonymous donor, PAWS is set to soon start construction of an addition to their feline area, named in honor of Cherene. 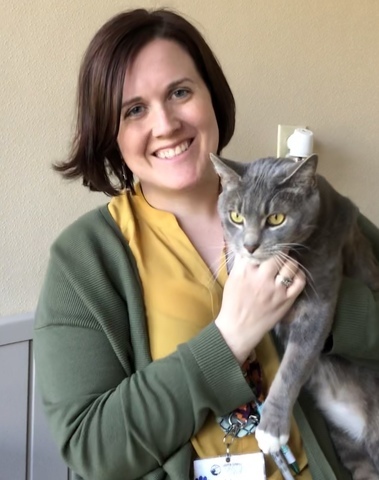 The 550 square-foot addition will provide two new communal cat rooms and one new meet-and-greet room where people get to know a cat they might like to adopt. The new additions will allow PAWS to take in potentially 20 to 30 more cats. PAWS encourages people to call about cats that they find. If their cat area is full, they work with other shelters, such as Pets Come First, to find space for cats in needs of shelter. They will also work with the people who found the cats to keep kittens with the mom as long as possible. Sometimes they receive orphan kittens as young as a day old without moms, and the many dedicated volunteers who work at PAWS have to bottle feed the young ones. Many of the cats at PAWS head to foster homes at times during the week, and with the upcoming addition, the shelter is going to need more volunteers and foster homes to help with the new cats. Of course all cats get spayed or neutered that come to the shelter, in order to help prevent more strays in the future. With more space, they can help more cats, but it will add up to more work for PAWS. Last year PAWS, which works with cats and dogs, saved 180 orphans kittens and 82 puppies. The non-profit saw 476 cats and 393 dogs get adopted. The organization spayed or neutered 1,720 cats and dogs helping control animal overpopulation. The addition for the cat area is still in the planning stages, but once all plans are approved, construction should only take six to eight weeks. PAWS will need volunteers to help save even more cats. Those who are interested in donating, volunteering or fostering pets can find information at www.centrecountypaws.org.